This option is controlled thru the Format (Stub), Format (Column Head), or Format (Data Cell) menus since only these have data values associated with them. 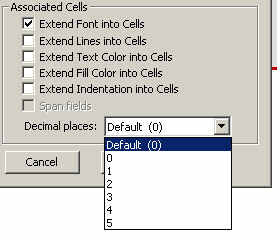 Users select the number of decimal places for the associated cells, i.e., the row, the column, or the data cell. Note: Rows or columns percentages are automatically designated as having one decimal place.